It’s the first Thursday of the month, which means it’s time for the next Leftovers Club post! If you are new to Dining with Dani, The Leftovers Club is a monthly baked goods exchange between food bloggers all across the nation. This month I was especially excited because I was paired with a new member and wanted to share my love of the group with her. When Johanna and I started discussing likes and dislikes, it mostly became a love fest about our Pitt Bulls. We even ended up sending each other’s pups treats too! I hope Johanna loves these cookies as much as I loved the Potpourri Cookies she sent me. Yes, potpourri. Definitely check the recipe for these creative sweets and leave her some love! Because it’s getting into that serious fall weather now (finally!! ), I wanted to incorporate some of my favorite Thanksgiving flavors into whatever I made. These fluffy and light cookies are full of two traditional sides — sweet potato and cranberry. I loved the way the two came together. Feel free to skip a step and use sweet potato puree instead of making it from scratch like I did. Oh! I also went ahead and made these cookies vegan, my newest baking obsession. Look forward to more vegan baked goods on the blog this month! 1. Peel the sweet potato and cut it into small cubes. Add the potato and a little bit of water into a food processor and blend until completely smooth. Set aside. 2. Mix together all of your dry ingredients — the flour, baking powder, baking soda, cinnamon, salt, and the brown sugar. 3. Add in all the remaining ingredients except for the cranberries. Mix until the batter is smooth. Gently add in the cranberries, being careful not to mash them into the dough. 4. Refrigerate the dough for at least an hour. 5. Pre-heat the oven to 350 F.
6. Drop the dough by generous teaspoons onto a greased baking sheet. 7. Bake the cookies for 12 minutes. Want to see all the delicious things my friends made this month? Here’s links to all of them! 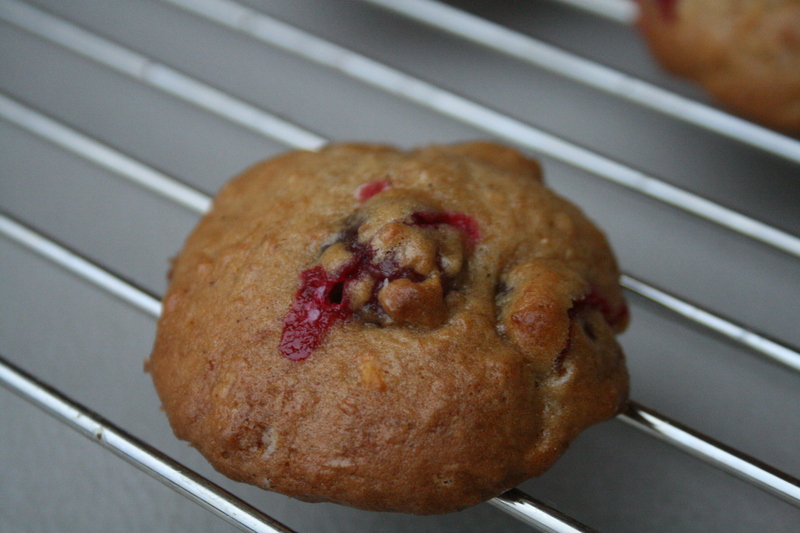 This entry was posted in Desserts and tagged cookies, cranberry, sweet potato, thanksgiving, vegan, vegetarian. Bookmark the permalink. 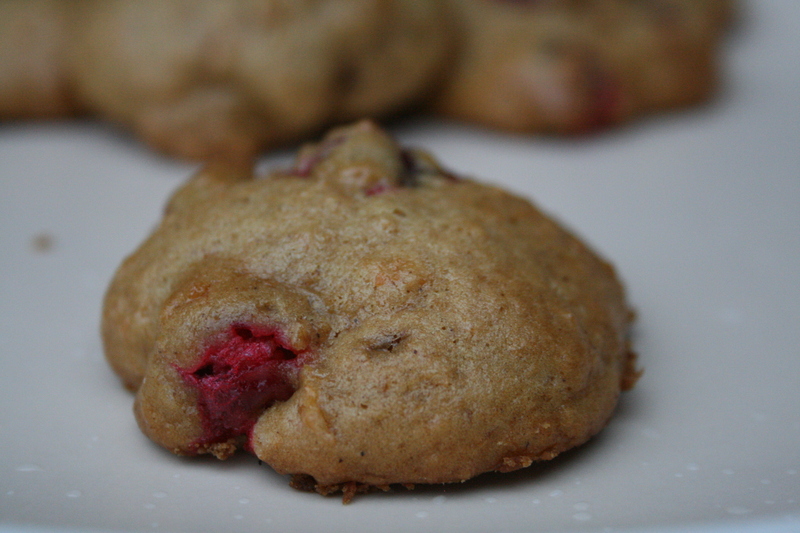 Sweet potato & cranberry in a cookie? Yum!! Oh no! I made these vegan because I saw on your site how much you loved vegan food, actually! Have him use 1/2 cup of fresh cranberries. I didn’t even notice that during editing I had erased that. Oops! I hope you like them! That was seriously so sweet of you!!! Trust me, both husband and the pups were in the dog house last night! wow – your cookies bear a strong resemblance to mine! They look so soft and fluffy. I should have veganized mine as well. Sweet potato and cranberry! Like Thanksgiving sides in a cookie!? what a great idea and perfect for the Leftovers Club! I love that you mixed two Thanksgiving flavors into this one cookie! I’m sure each bite was like a T-Day throwback. My husband finally got around to making your cookies! They are so soft and chewy. I am enjoying them with some very non-vegan ice cream 🙂 Glad I got to try the recipe! Yum–love the tart cranberry with the sweet potato!